Temperatures around the world could rise by as much as 11C, according to one of the largest climate prediction projects ever run. This figure is twice the level that previous studies have suggested. Scientists behind the project, called climateprediction.net, say it shows that a "safe" upper limit for carbon dioxide is impossible to define. The results of the study, which used PCs around the world to produce data, are published in the journal Nature. Climateprediction.net is run from Oxford University, and is a distributed computing project; rather than using a supercomputer to run climate models, people can download software to their own PCs, which run the programs during downtime. More than 95,000 people have registered, from more than 150 countries; their PCs have between them run more than 60,000 simulations of future climate. Each PC runs a slightly different computer simulation examining what happens to the global climate if levels of carbon dioxide in the atmosphere double from pre-industrial levels - which may happen by the middle of the century. The factors that vary most between the simulations are the precise nature of physical processes, such as the extent of convection within tropical clouds - a process which drives the transport of heat around the world. So no two simulations will produce exactly the same results. Overall, the project produces a picture of the possible range of outcomes given the present state of scientific knowledge. The lowest rise which climateprediction.net finds possible is 2C, ranging up to 11C. The timescale would depend on how quickly the doubling of CO2 was reached, but large rises would be on a scale of a century at least from now. "I think these results suggest that our need to do something about climate change is perhaps even more urgent," the climateprediction.net chief scientist David Stainforth told BBC News. "However, with our current state of knowledge, we can't yet define a safe level in the atmosphere." On Monday, the International Climate Change Taskforce, co-chaired by the British MP Stephen Byers, claimed it had shown that a carbon dioxide concentration of over 400 ppm (parts per million) would be "dangerous". 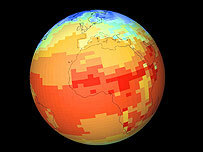 The current concentration is around 378 ppm, rising at roughly 2 ppm per year. Next week, the UK Meteorological Office hosts an international conference, Stabilisation 2005, announced by Tony Blair late last year. Its aim is to discuss what the term "dangerous" global warming really means, and to look at ways to stabilise greenhouse gas levels. Myles Allen, the principal investigator of climateprediction.net, said the focus on stabilisation might not be appropriate. "Stabilisation as an exclusive target may not be adequate," he told BBC News. "Stephen Byers claims to know that 400 ppm is the maximum 'safe' level; what we show is that it may be impossible to pin down a safe level, and therefore we should not focus exclusively on stabilisation." Distributed computing has been used before, notably by the Search for Extra-Terrestrial Intelligence or Seti, where several million people have downloaded software enabling them to analyse data from observations of distant stars for signs of alien life. The scientists behind climateprediction.net believe their project, because it is distributed to individual PCs, can help inform people about climate change - and that, in turn, could bring political change. "It's very difficult to get politicians to collaborate, not only across the globe but also over sustained lengths of time," Bob Spicer from the Earth Sciences Department at the Open University, told BBC News. "The people who can hold politicians to account are the public; and with this project we are bringing cutting-edge science to the stakeholders, the public."